Of course, if we were present, we might chuckle at the tribesman’s naiveté. The owners of such a great building would never greet people at the entrance. They leave such trivial tasks to hired servants, whilst they run the real business without ever needing any direct contact with visitors as they enter the building. And, in addition, doormen come and go – they are, after all, disposable. The owners – those who control what happens in the building – retain their positions over the long term… and may remain anonymous, if they so choose. We find this simple concept easy enough to understand, and yet we chronically have difficulty in understanding that, in most countries, the president, or prime minister, is not by any means the man who makes the big decisions in the running of the country. Similarly, the man whose family took over the financing of Europe, Meyer Rothschild, said, “Permit me to issue and control the money of a nation and I care not who makes its laws.” His family has been calling the shots for centuries, but like the owners of the apartment building, they keep a low profile. Remarkably, most people will nod their heads at the above quotes, yet somehow still imagine their elected leader to be in charge. Most anyone will accept that the voting system in their country has been corrupted in one way or another and it’s even more likely that they’ll acknowledge that the central banks control the flow of money. Yet, they persist in believing that, even if elections are financed by the big banks, the military industrial complex, Big Pharma, etc., somehow, those who are elected remain loyal to the voters, not to those who paid for their election. And, they imagine these elected members to be running the show. Further, whilst they often acknowledge that the political party that they oppose is bought and paid for, they prefer to think that the one they favour is not. At this point, both the EU and the US are run by the Deep State. In Europe it’s a bit more obvious, as the EU is a visible, unelected body that holds sway over all of the most significant developments in Europe. The US is run as a corporatist body – joint rule by big business and the state. The elected members are, like doormen, temporary. They are, of course, highly visible, which they’re intended to be, as they’re meant to distract the public eye away from those who are truly in charge. And, like doormen, they’re disposable. They can be unelected at four-year intervals and the agenda continues as planned. They are, in fact, largely irrelevant to the direction that the country takes. The president in particular falls into this category. There have been quite a few presidents, such as the present one, who rose to that post with little or no previous experience in elected office. Their election is a result of popularity. If they do a better job of creating campaign-promises than their opponents, they emerge as the winners, even if they have no political ties, associations with other legislators, or previous experience in the job. And yet, we somehow assume that those who really pull the strings would spend hundreds of millions of dollars on elections, then tolerate a newly-elected outsider to wash away their investment by actually taking charge. But, almost invariably, the “leader” sees that it’s in his interest to cave in to the Deep State, as, perennially, they hold the real power. Campaign promises are tossed into the dustbin and it’s back to the previous, ongoing agenda. This we’ve witnessed time after time. Nobody’s talking about it, but an estimated $846 billion mountain of money is expected to hit cryptocurrencies as early as April 2nd. That’s more money than the value of every single cryptocurrency on the market—combined. Three small cryptos in particular are expected to see the biggest portions of that cash… Details here. Does this mean that the president is only a mouthpiece for the Deep State? Well, no, it’s actually advantageous for him to express his own opinions, ruffle the public’s feathers and push his pet projects. It adds to the distraction that he’s in charge. However, the larger issues – particularly the flow of tax dollars into the pockets of corporations, continue exactly as planned, regardless of who’s in office. Bankers continue to receive absurdly large bailouts when they’ve grossly mismanaged their banks. The military industrial complex continues to enjoy perpetual warfare, so that they can supply armaments to the government for unnecessary conflicts. Big Pharma enjoys legislation that forces people to be vaccinated against their will and accept outrageously high prices for medications that are generally inexpensive to produce. But, yes, as long as a president remains the spokesman to explain why such policies are not only tolerable, but essential, he may be allowed to occupy the oval office until the voters tire of him. But, if this is true, why do people so quickly and so readily accept the “leader” to actually be unilaterally responsible for every facet of every governmental policy and action? Well actually, nothing could be easier. It’s human nature to want to put a face to our praise and/or criticism. We can’t muster the same focus if we’re advised that we’re being ruled by a faceless group. We tend to respond more readily and more intensely to a single individual – a face we can conjure up immediately. “People desire certainty,” Doug Casey once observed to me, when discussing a related subject, and that’s exactly so. If we’re uncertain during troubled times, we’ll instantly jump at the opportunity to put a single face to the problem, to blame one individual for whatever is troubling us. This is evidenced by the presentation of photos of Lee Harvey Oswald and Osama bin Laden, mere hours after major events, as the certain culprits. They were immediately accepted, without any question, by a people desperately seeking certainty. Therefore, as soon as one leader is out and another takes his place, we’re able to immediately transfer our devotion or hatred to the replacement. The concept of providing a single face to the public is one that was understood by George Orwell, who created the character of “Big Brother,” who would be on the video screens incessantly, as the face of the government. But, in stating all of the above, it may seem that I’ve portrayed the doorman as insignificant and this is not the case. He does play quite an important role. He’s absolutely essential, as he, more than any other legislator, creates a suitable distraction from those who really run the show. He’s in front of the microphone, does interviews, is filmed almost on a daily basis, and is constantly credited by the media as being either the saviour or the devil, depending upon which media outlet is providing the portrayal. And the shakier an economy, and the greater the problems of a country, the more essential it is that the “leader” be visible. After all, when things go badly awry, someone has to serve as the fall guy. When this occurs, he is, of course, disposable. He leaves in disgrace or is voted out and a new puppet is voted in whose loyalty is again to the Deep State, not to the voters. And, most importantly, the real agenda continues, as planned, regardless of whatever new campaign promises got him elected. Campaign promises are dumped wholesale; the demeanour of the new leader may change dramatically, and the new leader’s very principles may suddenly evaporate after election day. However, the ongoing agenda does not. Regardless of who’s elected, or what party he professes to represent, we witness a continuation of the previous directions taken by those who truly hold the power. 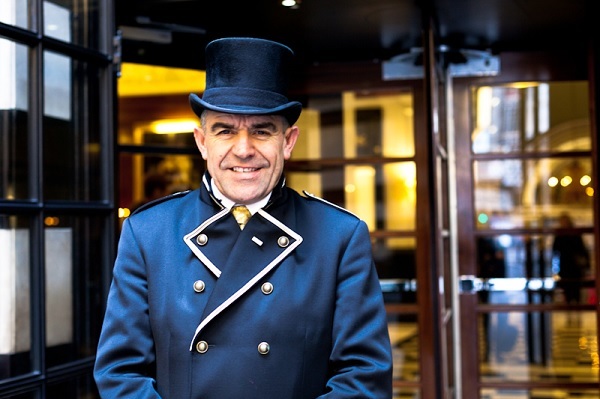 What’s important to recognize is that, no matter how large the apartment building may be, no matter how impressive the presentation of the doorman may be, he is just that. He is only the front man, and he is disposable. The Deep State runs the show. Their presence is permanent and their agenda is both ongoing and impervious to the whims of the voting public. Editor’s Note: The Deep State’s quiet control on the US financial system has pushed it to the brink.